Home > Resources > Clean up > How to Delete Documents and Data from Samsung Permanently? With the rapid replacement of smart phones, how to dispose of idle phones has become a problem. Except for giving away to family and friends, it is more likely to leave the old cell phone at home or sell it online since it is really a pity to throw it away. However, are you aware of the hidden dangers lurking in your phone, such as the leakage of private data like photos, videos, account & password, contacts, messages and etc.? Even though you have deleted your data on your device and reset your Android device to factory settings, there are still ways to restore deleted data from Android phone like Samsung with third-party recovery tool. So this article will show you how to permanently delete documents and data from Samsung device for your reference. First of all, you can check how to restore Samsung device to factory settings so as to delete documents and data on Samsung phone. But please be noted again that it is not the safest way to clear documents and data on Samsung device as mentioned above. Step 1. Unlock your Samsung device and launch Settings app on your Home screen. Step 2. Tap "Back up and reset" option under Personal section. Step 3. Tap "Factory data reset" option under Personal data section. Step 4. Read the notes to know what what happen after reset your Samsung to factory default settings, and tap "Reset device" option. Is it safe enough? No, you can still recover Samsung data after factory reset. But there is still a way out for you as below. To delete Samsung documents and data forever, you'd better rely on a professional third-party cleaning tool - Android Data Eraser (Windows/Mac). With this cleaning tool, you can easily clear documents and data from Samsung device with one simple click, including the photos, videos, contacts, messages, call history, notes, calendars, search history, app data, app caches and other personal files or junk files. And this program is fully compatible with all Samsung devices, including Samsung Galaxy S9+/S9/S8+/S8/S7/S6/S5/S4, Samsung Galaxy Note 8/7/5/4, Samsung J3/J3 Pro, Samsung Galaxy A9/A8/A7/A5, etc. and all other Android devices like Huawei, LG, HTC, Sony, Motorola, ZTE, OPPO and etc. Below are the download links of the program in Mac version and Windows version, please choose the right version to install on your computer to delete Samsung documents and data with ease. With the professional Android Data Eraser, you can easily erase documents and data from Samsung permanently with 1-click. Believe or not, just check the instructions on how to perform this program to delete documents and data on Samsung device as below. Warm Prompt: To avoid unexpected data lost, please remember to backup your data on Samsung before the whole process. Step 1. Launch the Android Data Eraser on your computer, either on Windows PC or Mac. Connect your Samsung device to computer with a USB cable. Then install the MobileGo connector on your device as prompted to detect your device successfully. Step 2. 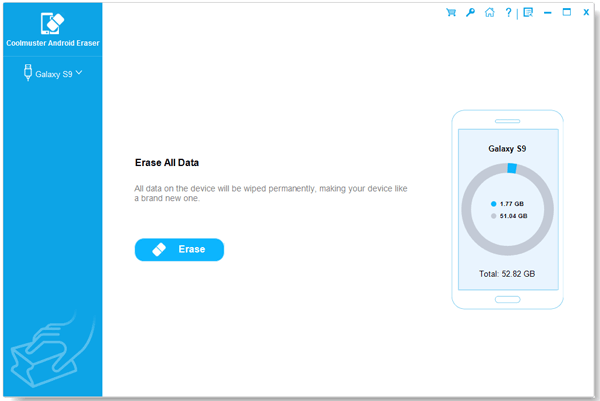 After detecting your Samsung device, please choose the "Erase All Data" mode on the interface to wipe out all files from your Samsung device, including the documents and data on your device. Now, you can safely either sell or give away your Samsung device to others now with no worry about the recovery of the deleted Samsung documents and data.